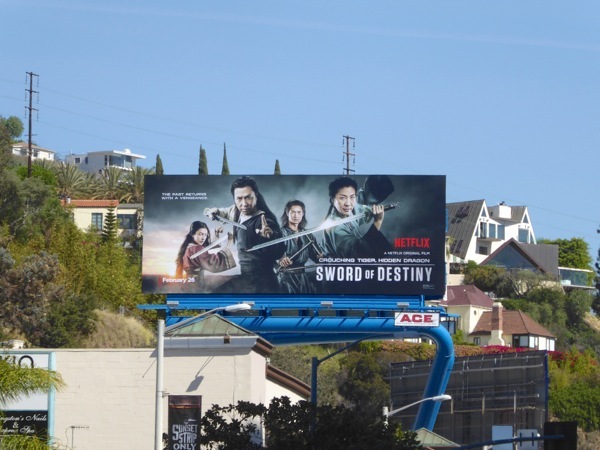 These days it's hard to keep up with all the billboards for Netflix's original content, be it comedy specials, documentaries, TV series or new movies. 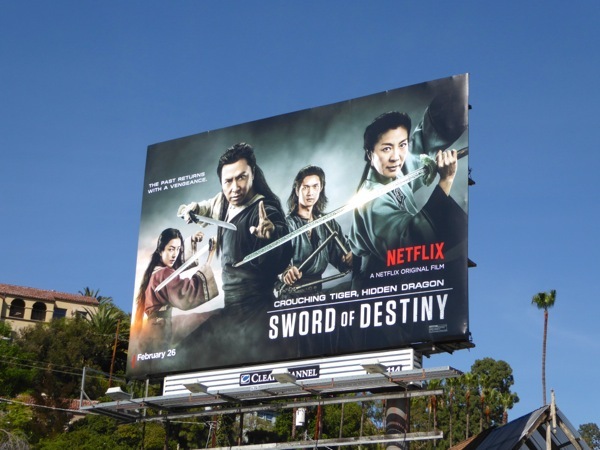 Compared to other big studios, the subscription streaming service doesn't promote too far in advance of its release date either, choosing to advertise when its offering are available to watch almost immediately. Having enjoyed great success with TV shows like House of Cards, Orange is the New Black and Unbreakable Kimmy Schmidt, they've recently turned their attention to acquiring films which would normally appear on the big screen (much to the chagrin of other studios), like the recent Beasts of No Nation and the sequel to 2000's Oscar-winning epic, Crouching Tiger, Hidden Dragon. 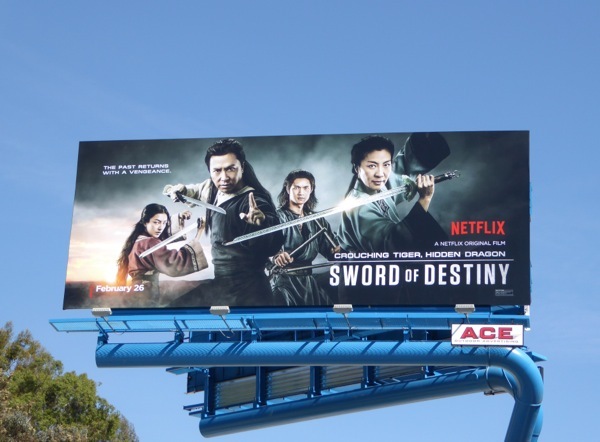 Fifteen years later and Michelle Yeoh is back as warrior 'Yu Shu Lien' to defy gravity again through the wonders of wire-work stunts in Sword of Destiny. 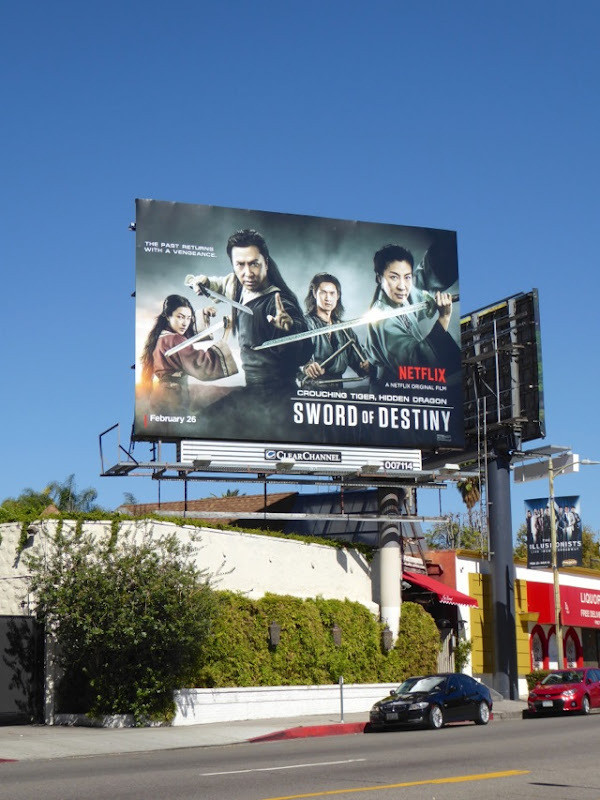 This time she's joined by Donnie Yen, Natasha Liu Bordizzo and Harry Shum, Jr. to thwart an evil warlord and safeguard a legendary sword in a tale of young love, lost love and redemption. 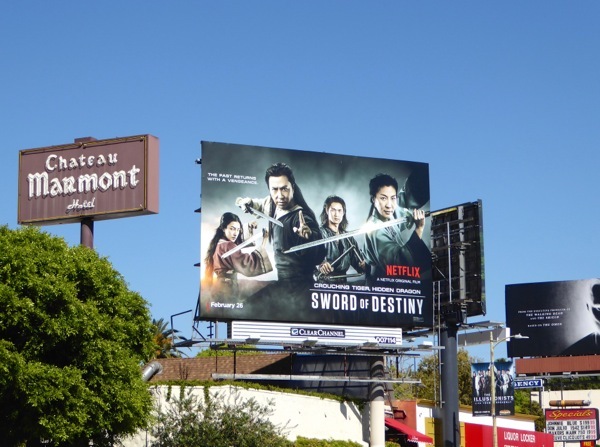 These sword-wielding billboards were photographed in two locations along West Hollywood's busy Sunset Strip on February 24, 2016. 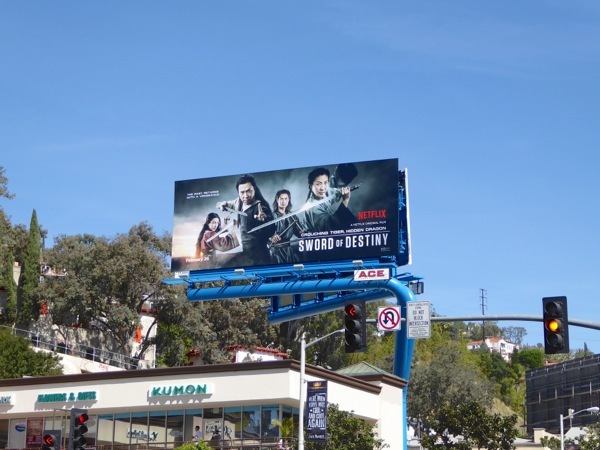 For more martial arts-themed billboards, be sure to also check out these 47 Ronin movie billboards and Into the Badlands TV billboards. Let's see if this new installment be able to capture the same sense of awe and exhilaration as the original Ang Lee-directed box office phenomenon and spawn more fantastical martial arts movies in the future.